Laboratory of Biophysics and Bioinformatics was founded in 1990. Its origins go back to 1972, when in the Laboratory of Electrical Stimulation and Defibrillation of the Heart, the research group on electrophysiological was created. In 1982 on the base of cardiac electrophysiology research group the Laboratory of Cardiorythmology and Electrical Stimulation was founded. In 1990 the latter part of the laboratory staff has established Laboratory of Biophysics of Excitable Systems (recent – Laboratory for Biophysics and Bioinformatics). Objectives of laboratory were: investigations of myocardial passive and active properties under normal conditions and under ischemia, investigation of intercellular communication mechanisms on the single channel level and mathematical modelling of intercellular communication; and evaluation of functional properties of viable tissues and systems: biophysical modelling based multivariate analysis of multimodal biomedical data. Recent advances in electronics and information technologies opens new possibilities of multimodal registration of acoustical, and electrical signals and optical images in extraordinary variety of spectral bands comprehensively reflecting valuable diagnostical information in multimodal way about wide range of objects, starting from isolated cells, through tissues, organs till systems of whole organism. Effective usage of such possibilities using advanced imaging and mathematical information processing methods opens the way for breakthrough in most actual areas of healthcare. Effective diagnostics, prevention and control of age related degenerative processes in human body could be achieved using biophysical models based imaging and quantitative evaluation methods. Researchers of Laboratory for Biophysics and Bioinformatics, having sufficient experience and basic technological resources are planning to elaborate biophysical models based biomedical signal and image analysis methods able to detect pathological changes in living tissues and systems, evaluate interrelations of several concurrent processes causing pathogenesis of the diseases. It is planned to create: a specialized methodology for elaboration of tissue structure/pattern evaluation methods; methodology for usage of multivariate analysis for multimodal signals and images; strategies for elaboration of biophysical models based multimodal signal and image analysis for functional properties of organs and systems in human body. The work will be performed in collaboration with Laboratories of Ophthalmology and Biochemistry, Department of Neurology, and Institute for Digestive Research. 2018 – the Baltic-German University Liaison Office project "Synaptic and dendritic dysfunction in Alzheimer‘s disease: computational and experimental neuroscience perspectives to understand the dynamics of neurodegenerative processes", funded by the German Academic Exchange Service (DAAD) with funds from the Foreign Office of the Federal Republic Germany. The aim of the project is to investigate complex interactions of hippocampal CA1 pyramidal neuron deficient cholinergic neuromodulation, synaptic dysfunction and dendritic atrophy due to beta-amyloid peptides accumulation in Alzheimer’s disease applying computational modelling approach. Project leader dr. A.Saudargienė. Université de Rennes 1, France; Pontifícia Universidade Católica do Rio Grande do Sul / Microgravity Centre, Porto Alegre, Brazil; Albert Einstein College, NY, USA; State University of New York, USA; University of Michigan, USA; Free University of Berlin, Germany. Protein aggregates containing beta amyloid (Aβ) and other multimeric proteins are critical factors in the pathogenesis of neurodegenerative diseases (including Alzheimer's disease) by causing synaptic dysfunction, neuronal death and loss. Molecular mechanism by which protein aggregates cause death of brain cells and activation of neuroimmune processes will be investigated. Alongside, search and investigation of possible pharmacological modulators of the processes involved will be performed. The study also will focus on mechanisms of ischemic mitochondrial damage in brain tissue. The possible sites of ischemic damage in mitochondria will be determined and the possible protective pharmacological agents against ischemic mitochondrial injury will be tested. In the frame of the Global Grant project, cultures of human inducible pluripotent stem cells will be introduced as a model to investigate how human cells die and how to protect them from ischemic damage. A wide comparative analysis of effects of ischemia and reperfusion on immature, mature and aging brain cells (neurons, astrocytes and microglia) will be performed to test whether potential inhibitors of mitochondrial permeability transition pore can protect against ischemia-induced cell death or inflammatory responses in the brain and help to restore functional activity of neurons. We are going to determine which compounds (synthetic and natural), acting separately or in combination with pharmacological compounds, are able to suppress viability of brain cancer cells, mitosis/interphase cycle, proliferation and migration of cells in the model systems. We are planning to reveal possible molecular mechanisms of action of those compounds in model systems. We expect that obtained data will pave the way for the in vivo studies on mice glioma allograft and human/mice xenograft models, and will allow us to confirm and specify in vitro data. The Laboratory has expertise in primary neuronal and transformed cell cultures; cell biology; potentiometric methods using oxygen, nitric oxide and ion-selective electrodes; spectroscopy, fluorescent microscopy, protein chemistry, DIGE, etc. The Laboratory participates in a project of the Advanced Pharmaceutical and Health Technologies Centre of Lithuanian University of Health Sciences. The researchers have access and are actively using open access facilities of the Laboratory for Pharmacological Regulation of Pathological Processes and Research of Drug Metabolism. In 2012, prof. V.Borutaitė was awarded with Osvalds Šmidebergs Medal of Latvian Society of Pharmacology. In 2008, prof. A.Toleikis, prof. V.Borutaite, prof. V.Mildaziene (former member of the laboratory) were awarded with Lithuanian National Price for Science. Members of the Laboratory in collaboration organized the 4th MiPsummer School on Mitochondrial Physiology in Druskininkai, Lithuania on June 10-16, 2010. Laboratory was established in 2011, and currently involved in research of neurodegenerative diseases. In 2018, after reorganisation, got the name of Laboratory of Behavioral Medicine. Brain disorders are often incurable and debilitating diseases associated with progressive disability and poor prognosis. The prognostic value of currently available clinical prognostic models remains sub-optimal and should be improved in order to allow more accurate assessment of disease severity, clinical outcomes and patient-oriented outcomes. Certain psychological (i.e., psychological distress) and neuroendocrine (i.e., thyroid hormones) factors can be important biomarkers of outcomes in brain disorders; however, further studies aiming to elucidate the prognostic value of these prognostic factors are warranted. Patient-oriented outcomes are becoming increasingly used when evaluating treatment efficacy and patient prognosis, especially among patients suffering from incurable and debilitating disorders, such as brain tumours. The main goal of our Laboratory is to identify novel neuroendocrine and psychological markers associated with disease severity, clinical sequalea and patient-oriented outcomes of patients suffering from brain disorders. These findings can potentially improve accuracy of currently available prognostic models and open new avenues for developing more effective treatment strategies of brain disorders. Journal "Biological Psychiatry and Psychopharmacology"
In 1976, a group of scientists in Department of Biological and Bioorganic Chemistry began to study the biochemical peculiarities of energy generation in tissue repair. This group was the core of Pathochemistry Laboratory, founded in 1979. In 1982, the Laboratory was integrated into the structure of the Central Research Laboratory. Extending their scientific research, in 1983 some of the scientists assigned to the independent Laboratory of Physical and Chemical Research, renamed in 1988 into Laboratory of Clinical Chemistry. In 1992, the laboratories merged into the Laboratory of Pathochemistry of Institute for Biomedical Research. In 2011, the Laboratory of Pathochemistry was reorganized into the Laboratory of Molecular Neurobiology of Neuroscience Institute. The aging appears to be one of the main reasons causing many of neurodegenerative diseases.This study is intended to evaluate the changes of the antioxidant defence system activity in the brain and other organs, during aging and to answer the question whether natural antioxidants are good for healthy aging. It is planned to assess the antioxidant defence system activity and lipid peroxidation of the laboratory animals of different ages; to determine the biochemical mechanisms of the impact of prooxidants in animal organs; to assess the effects of natural antioxidants on the cellular antioxidant defence system; and to evaluate the apoptosis in the organs of different ages animals, exposed to either prooxidants and antioxidants. The results will be important both for researchers, working in the field of gerontology and for pharmaceutical specialists, developing natural medicines and supplements known to have antioxidant properties. Institute of Public Health and Environment (Bilthoven, The Netherlands), University of Aarhus (Denmark), University of New York (USA). The Laboratory of Neurosciences was established on April 28th 1978, as a sub-division of the Oncology Scientific-Research Institute, Ministry of Health Care. The task of Laboratory was to organize additional scientific research to analyze the central regulation of brain and systematic blood circulation. In the structure of Oncology Institute, it was referred to as the Nervous System Surgery Department while Department of Neurosurgery of Kaunas Medicine Institute Clinics was appointed as its clinical basis. In due course, namely in 1982, the Laboratory moved from Oncology Institute to Central Scientific-Research Laboratory of Kaunas Medicine Institute and was renamed into Nervous System Surgery Laboratory. In 2005 the Laboratory was renamed into the Laboratory of Neurosciences and in 2011, after reorganisation, Laboratory got the name of Neurooncology and Genetics, and functions in the structure of Neuroscience Institute of Lithuanian University of Health Sciences. In 2011 Laboratory got the name of Neurooncology and Genetics and in 2018, after reorganisation, got the name of Molecular Neurooncology . The main trends of research work are: research of clinical, etiopathogenetic, radiological factors, playing a decisive role in the course of CNS tumours and the accumulation of pathological material for the investigation for new combinations of clinical genetic and epigenetic markers in diagnosis and prognosis, research on diagnostic molecular markers in glioblastoma and pituitary adenoma, optimisation of the surgical diagnosing of cerebral gliomas using innovative optical technologies. 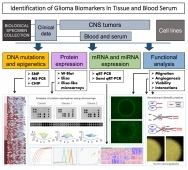 The main goal of these studies is to estimate the complex of molecular markers (projects GREAT and GlioPRoSer) and clinical factors valuable for rare CNS diseases diagnosis and prognosis, to identify molecular factors that are responsible for the initiation of cancerogenesis in CNS cells (project "Novel systems of prodrug activation for the cancer gene therapies") and to evaluate the possibilities of combination of intraoperative tissue identification methods by segmentation of intraoperative magnetic resonance, 3D ultrasound and fluorescence images for optimal visualization of brain tumours. Research on epigenetic alterations (DNA methylation, chromatine modifications, miRNAs, etc.) of genes associated with oncogenesis, invasion and resistance to therapy of glioblastoma; research on association between gene epigenetic alterations and gene expression (at mRNA and protein level) in glioblastoma tissue; investigation of the influence on certain gene expression and function of epigenetic promoter alterations (DNA methylation, chromatine remodeling), caused by in vitro manipulating cell culture; selection on the relevance of epigenetic alterations and gene expression diagnostically meaningful genes or gene complexes in glioblastoma and pituitary adenoma. Employing three imaging modalities there will be created methodology for coregistration of 3D interlinked information. There will be investigated methods for quantification and segmentation of FS, US and MRI images. Processing of interrelated images is planned to implement in optimised algorithms to support tissue discrimination. The information and experience obtained from this research could be used for developing new diagnostic methods and developing a methodology for the search for new therapeutic agents against rare CNS diseases. Laboratory of Neurophysiology continues research themes started earlier by three previous neuroscience laboratories. In 1957, Laboratory of EEG in Kaunas Institute of Medicine was created. Later, Laboratory of Neurophysiology and Laboratory of Neurocybernetics were created. Scientific research was carried out in several directions: experimental – investigating the nature of high and low frequency biocurrents in the brain; pharmacological – investigating influence of pharmacological substances on biocurrents; theoretical – investigating biophysical nature of brain potentials and properties of dendrites with nonlinear electrical properties; clinical – investigating EEG, neurological characteristics and activity spreading pathways in epilepsy and other brain injuries. Since then 21 PhD and 5 Habil. Sc. dissertations were prepared and defended in these laboratories. Identification of the relation between neuronal activity and behaviour is necessary in order to understand the function and pathology of the nervous system. Since Alzheimer disease disrupts collision detection, the study of neuronal mechanisms of this behaviour could be important in early detection of the disease. We will study neuronal network spontaneous and induced activity in in vitro and in vivo mammalian cortex, colliculus superior and frog tectum by applying visual stimulation, neuronal registration and methods of molecular biology. The investigation will aim at elucidation of synaptic and membrane mechanisms of neuronal network spontaneous and evoked activity. Copenhagen University (Denmark), New York University (USA), University of Oslo (Norway). Laboratory of Toxicology (from 2011-07-01 till 2018-01-01 was Laboratory of Neurotoxicology) was established in 2011 via reorganization of the Laboratory for Environmental Health Research. The latter Laboratory was established in 2005 after merger of Laboratory for Anthropogenic Factors Research and Laboratory of Ecological Monitoring of Human Health. These laboratories were established in 1989 for implementation of Lithuanian State Program of Ecological Monitoring. Researchers of the Laboratory were innovators in Lithuania of heavy metals and trace elements investigation and assessment in various biological media (human hair, blood, urine, and biopsy material, experimental animals, etc). The focus of Laboratory research is investigation of trace elements and their biomarkers in connection with public health, occupational health, and clinical research (e.g. trace elements equilibrium in patients with chronic kidney insufficiency, manganese as prognostic value of hepatic encephalopathy, disorders of copper metabolism in patients with Wilson’s disease, involvement of cadmium in pathogenesis of breast cancer, etc.). There were 9 PhD thesis defended at the Laboratory during 1989-2011. Glioblastomas are the most common and the most aggressive malignant primary brain tumours in humans. In spite of multiple therapies the survival rate is only 12-14 months after diagnosis. These tumours are resistant to treatment and frequently implicate multidrug resistance phenotype. The mechanisms are not fully understood though it is known that metallothioneins (MT) might be involved in forming multidrug resistance. Metallothioneins are intracellular low molecular weight proteins, MTs function is not clear, but experimental data suggest MTs may provide protection against heavy metal toxicity, be involved in regulation of physiological metals (Zn and Cu) and provide protection against oxidative stress. The MT expression in some tumours correlates with degree of malignancy and tumour growth rate. It is established that single nucleotide polymorphism SNP of the gene MT2A is involved in accumulation of Cd, bioaccessibility of Zn, and Mg and Fe amount in blood. Therefore, the data on relation between trace elements, metallothioneins and MT gene polymorphism are lacking. Since 2006, the Laboratory is Lithuanian Satellite Centre of Trace Element Institute for UNESCO. Laboratory was established in 1992. The areas of scientific research are: epidemiologic investigation of eye diseases; complex ultrasonic investigation of structure, dimensions and haemodynamics of ocular tissue; storing and processing of ophthalmological images and signals for interactive and automatic multi-criterial clinical decision support. During collaboration with Sweden, Holland, Brazil in international E-Health and Telemedicine projects, infrastructure for scientific research in virtual environment was established. In 2003 Telemedicine centre of Kaunas University of Medicine (Lithuanian University of Health Sciences since 2011) was established, that is now institutional member of International Society for Telemedicine and e-Health (ISfTeH). In the Laboratory 12 doctoral dissertations have been defended. The Laboratory was awarded with eEurope Award for e-Health 2003 “e-Health NetLit (LT)" - a Finalist Diploma in a High Level Conference and Exhibition on e-Health, Brussels, 22, 23 April 2003. Age related macular degeneration (AMD) – age related neurodegenerative disease of macula – central part of the retina. It leads to considerable visual loss. AMD is one of main causes of blindness in people in age over 60. Because of progressive loss of central visual function, it has marked influence to patient behaviour and life quality. In 2002 in Lithuania was 13.8% blind people because of AMD. In 2020 the amount of handicapped people because of AMD will increase to 16.5%. Unfortunately, today AMD is not treatable. However, up to now there is no proper treatment for age-related macular degeneration though novel treatment methods can stop progression of AMD and to help avoid blindness. That is why new information about pathogenesis of AMD can support development of the new methods of treatment and prevention of this disease. Diagnosis, observation of course and treatment of AMD needs high resolution imaging technologies, parameterisation and high skilled ophthalmologist evaluation. Quantitative evaluation of this visual information could be achieved using biophysical models based imaging and quantitative evaluation methods. Researchers of Laboratory of Ophthalmology in collaboration with Laboratory for Biophysics and Bioinformatics are planning to collaborate for biophysical models based biomedical signal and image analysis methods to process a big amount of information from biomedical signals, images, clearing up changes in eye neurosensoric function in AMD and reflecting the relation to genetic polymorpfisms. For this purpose some genetic markers (MMP-2 -1306C/T and -735C/T, MMP-3, -1171 5A/6A, MMP-9 -1562C/T, ApoE) will be investigated. The Laboratory for Research of Pharmacological Regulation of Pathological Processes and Drug Metabolism funcions in the Advanced Pharmaceutical and Health Technologies Centre of Lithuanian University of Health Sciences.